Spurs edged out Burnley 2-1 at White Hart Lane on Sunday but remain 10 points behind the league leaders, whose win over Crystal Palace on Saturday continued an astonishing 11-match winning run. Tottenham now sit fifth, one point behind Arsenal, and Pochettino insists his side can still become champions in May. "Are Chelsea out of sight? 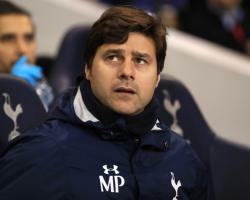 No, it's true that we have a 10-point gap with Chelsea," Pochettino said. Not only because last season was a similar gap with Leicester, eight or nine points in that period. Now we are winning games, keeping the gap now a little bit closer to second position. I think it's still a long way until the end of the season." Tottenham endured a sticky period through October and November but they appeared to have turned a corner, having now won four out of their last five matches. Danny Rose clinched all three points against Burnley with a superb second-half strike after Dele Alli had earlier cancelled out Ashley Barnes' opener. Spurs' victory, however, was not without controversy as substitute Moussa Sissoko escaped a red card, just moments before setting up Rose's winner. Sissoko caught Burnley's Stephen Ward with a high tackle and Dyche said referee Kevin Friend was too lenient in only issuing a yellow card. He then set up the goal," Dyche said. "It is a decision which is so obviously a sending-off. "You cannot go into a challenge blind, with your hands over your face and a high foot and then stay on the pitch." Pochettino had not had time to see a replay of the challenge when speaking after the match but the Argentinian felt the right decision had been made. "But it's difficult because no time to see on the TV."